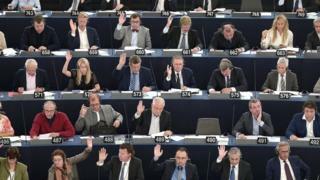 The European Parliament has voted against a set of rules intended to safeguard "net neutrality" in the EU. A series of amendments to a regulation on how internet traffic is managed in Europe were all rejected by MEPs. Proponents of net neutrality, who demand that web traffic be treated equally by networks, have already criticised the move. The existing legislation, which was accepted, will be developed into regulations. Campaigners have said that provisions for protecting net neutrality in the existing text of the rules are too vague and many worry that it will be easy for internet firms to strike deals with content providers which may not be advantageous for everyone. For example, it is thought that so-called "zero rating" agreements, in which customers can access certain sites and services for free outside their data plans, might become more widespread. While this could be beneficial for those who want to access content from those providers, others worry that it will stifle innovation. The rules, however, do stipulate that network companies will not be able to offer or market paid-for access to "fast lanes". Traffic management, they add, should be based on objective technical requirements. Although some campaigners had suggested there might be growing support for the amendments within the parliament, all were voted down in large majorities. It is thought that many MEPs would have been reluctant to begin a process of amending the regulation given that it might have delayed another aspect of the rules - the abolition of mobile data roaming charges. Media captionNet neutrality: What does it mean? The result is "hardly surprising" according to legal expert Chris Marsden at the University of Sussex, given that many of the major parties represented in the parliament all supported the regulation text without amendments. The Body of European Regulators (BEREC) would now have nine months to issue guidelines to bodies like Ofcom in the UK, he added. "So, [by] September next year we will have the guidelines and the real enforcement work begins," he told the BBC. Dr Marsden also said there were still plenty of unknowns, such as what form regulations on "zero ratings" and fast and slow lane services might actually take. There was also the issue of how laws in the Netherlands, Slovenia and Finland - which all have special net neutrality protections in place - would be affected. Some initial guidelines, Dr Marsden added, would not be ready until 2016. Michael Theurer, a liberal German MEP described the outcome as "regrettable" and added that he felt the regulations as passed do not include a clear definition of net neutrality to inform regulators. Prior to the vote, the inventor of the world wide web Sir Tim Berners-Lee and a host of tech companies had expressed their support for the amendments and urged MEPs to vote them through. "The fact is that what we use the internet for in 2015 is vastly different from those early days when Tim Berners-Lee was inventing the web," commented Chris Green of business consultancy Lewis as he pointed out that the rise of video streaming had placed extra burdens on network companies. "Maintaining that information flow is an expensive process and the cost of running that infrastructure is falling on the shoulders of ISPs. "For them, a two-tier internet makes much more sense," he told the BBC. Who had argued that the amendments be adopted? Besides a host of net neutrality campaigners, inventor of the world wide web Sir Tim Berners-Lee had added his voice to those supporting the amendments. And a string of tech companies signed a letter to the president of the European Parliament, Martin Schulz, asking MEPs to adopt the amendments. The firms included Netflix, Tumblr, Vimeo, Kickstarter and Reddit. These laws might have to be altered depending on how the new, EU-wide rules are interpreted by regulators later.